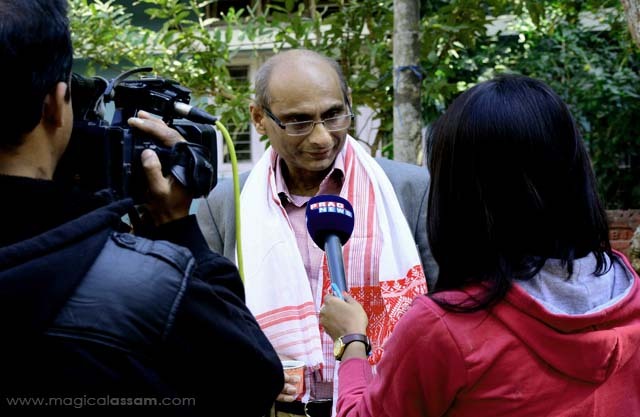 More than 30 years ago, Dr Ranen Sarma left Assam to study medicine in England. After his studies, he stayed on, and for more than a quarter of a century, he has been a general practitioner, working for Britain’s National Health Service. He treats a diverse range of patients, many of whom are confronted with considerable health and social problems. It’s a tough job, but Dr Ranen Sarma knows how to relax; he takes regular walks, goes to the cinema and listens to music. But Sarma’s interest in films and music is much more than mere recreation. He is a film producer, and has also produced a few music albums. Of late, the medicine man is busy heading multiple projects in Assam. 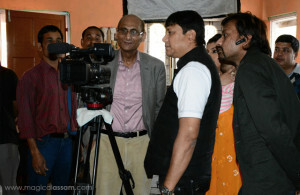 He was in Guwahati recently, working as the producer of a new Assamese TV series and an upcoming music album. Produced under his flagship banner Randeep Production, the TV show titled ‘Jeevanor Chaknoiyar Somadhan Bisari Habathuri Khalu Aji Moi’ carries a social message. The serial, to be telecast on Prag Channel from May onwards, relives his personal experiences over the years. Scripted by noted litterateur Prabhat Goswami, this ten-episode serial is directed by filmmaker Munna Ahmed. Dr Sarma is also producing a rare audio-video music album in Assamese, titled ‘A Collection of Nazrul Geeti and Rabindra Sangeet’, comprising of eight songs, each by Nobel laureate Rabindranath Tagore, and the national poet of Bangladesh – Kazi Nazrul Islam. The album also features some rare archival tracks by two of the greatest poet-lyricists ever. The lyrics to all the songs have been translated into Assamese from Bengali by Mukti Choudhury, former Principal of Cotton College. The songs, recorded in Mumbai and Kolkata, have been rendered by some of India’s famous singers like Anup Jalota, Mhalaxmi Iyer, Sadhana Sargam and Indrani Sen. And the videos for the same have been choreographed by Arindam Seal. The album should be released in the month of May. Dr Sarma has plans to launch the album at a cultural event on May 7. His first foray into filmmaking wasn’t successful commercially, but ‘Ahir Bhairav’ (Songs of the Dawn) earned critical acclaim and won awards at the New York Independent International Film Festival. The first Assamese language drama ever filmed on location in London, ‘Ahir Bhairav’ used song and dance to portray how an aspiring family coped when a much loved daughter became schizophrenic. It remains the most expensive Assamese film till date. Dr Sarma even organized some very successful and popular screenings of the movie in towns and villages across Assam. He followed it up with another film, a documentary – ‘From London with Love’. Made with the co-operation of doctors, patients and psychiatrists, the film illustrates how the lives of schizophrenics in India could be transformed by using the low-cost ‘shared-care’ treatment approach that is being pioneered in Assam. Both the films are now available on YouTube. Dr Sarma had also produced a DVD and CD compilation of the renowned poet Kazi Nazrul Islam’s works, titled ‘Love His Songs’. It featured 12 of Nazrul’s popular compositions, with the music orchestrated and arranged by Rahul Chatterjee. Dr Ranen Sarma’s initiative in making these projects shows that even as his medical career led him to England, his ties to India’s cultural life remain indelibly strong.